Pease Note: A lot of people want to schedule visits to see Diesel and Enoch and we are always happy to accomodate this request.. With Diesel this is quite simple, but with Enoch it must be scheduled in advance so that it will be at a time when he is in our kennel for training or breeding. We are fortunate to get to work with and be around Enoch very often, but most people don't realize that Enoch has been lovingly owned by our good friends Jeff and Liz since the age of three months old. We have been and always will feel proud to be the broker of stud services, trainer, and show handler of our favorite male offspring in recent history. 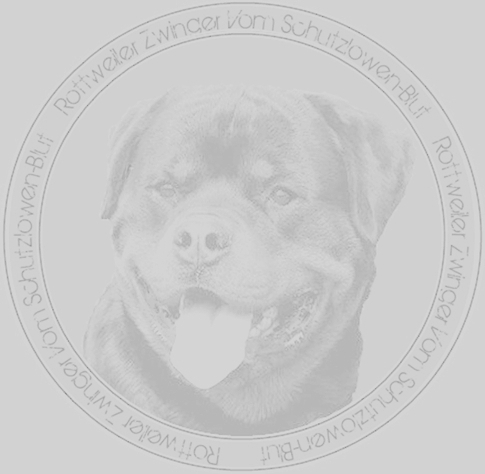 Enoch Vom Schutzlowen-Blut is a true beast to look at... Like his half brother, Diesel Vom Flood, he is an enormous, beautifully well put together, large framed, athletic, and intelligent male with a super disposition. He has the same incredible disposition of his father, Quaid Vom Hause Enzian, known all over the world for his clear head and discretion while working. Enoch is, however, much bigger in stature than his world famous father Quaid, and most resembles his mother's father Henry Von Den Hassberghohen! 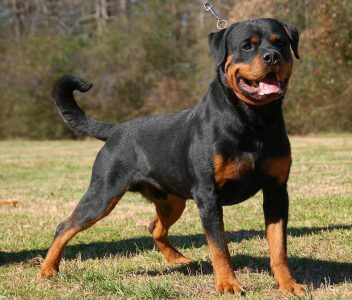 He has the beautiful, crisp, drawn on markings and exemplary confirmation that have made his father and grandfathers famous rottweiler studs and champions worldwide. In our opinion, Enoch has Quaid and Henry's incredible markings, with Henry's size, and a head the size of Henry's brother, Hero Von Den Hassberghohen. The best thing, in our opinion, is that while his head is as big as Hero's, it is not sooty, dark, and somewhat wet, like Hero's! We feel fortunate that Enoch is such a monster, because Orlando lines tend to control and limit top size and Enoch, Diesel and their half brother Pummel Von Kalenborn are three of the few Quaid Vom Hause Enzian son’s that have reached 67.5 cm tall! Enoch’s large frame lends to his powerful and harmonius movement, and outstanding speed and agility. He has power out of the blocks like we haven’t seen in our kennel before, due to his powerful, thick, hind quarters. His drive is extremely high, just like his world famous rottweiler mother Nixe Von Der Blockhutte and the kennel name that she bears, yet he has perfect manners when not at work or play. He has an incredible head, with a noble expression, and a great stop that falls off the table. Enoch’s coat is short, soft, and correct, and his eyes and mouth are jet black. 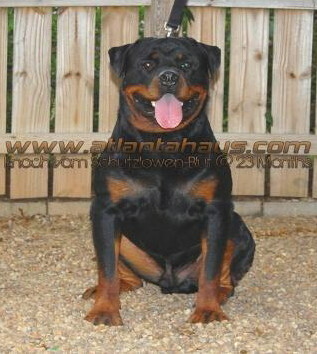 Thanks to generation after generation of the highest level of breeding available in Germany, we have recently found through lab testing that he is an extremely potent breeder (1 billion plus sperm count) and will dominantly pass his wonderful traits on consistently to his future rottweiler puppies. 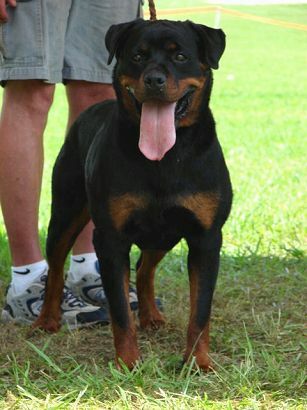 Enoch’s pedigree is everything that we look for in a foundation german rottweiler stud male. He is the image of the realization of royal German ADRK breeding coming off of the paper that the pedigree is written on into real life. His champion rottweiler pedigree, along with his sisters Empira and Esprit, is one of the poudest points in the modern era of our famed kennel's history!